Misti Chunky Ribs & Ruffles Scarf - Complete! I finally finished my Misti Chunky Ribs & Ruffles Scarf WIP! Just in time to give to my mom for her b-day, too! Above are some more in-process photos. I worked on this here and there over the weekend. The yarn is so plush and a dream to work with. I loved seeing all the different colors of the handpaint showing through here and there. The browns would transition to the most vibrant turquoise...then to a pretty purple...then a hint of pink. The colors on this yarn are great! And, here are some photos of the completed work. Phew! I barely finished this on time. No, seriously, I was working the last row (of the regular pattern) as my parents were pressing me to go, saying "It's going to snow later, you guys better get on the road." Then, I had to hit up Youtube.com to figure out how to knit in the front and back of a stitch, but found a great video by Knitwitch (I think that's their user name). I knitted up the last 2 rows (of ruffle) and hid the tails and voila! Project complete. B-day present? Check! I happily gave mom her new scarf and we hit the road to head on home. I started working on a gift for a good friend of mine on Saturday. I'm making baby booties for an upcoming baby shower. 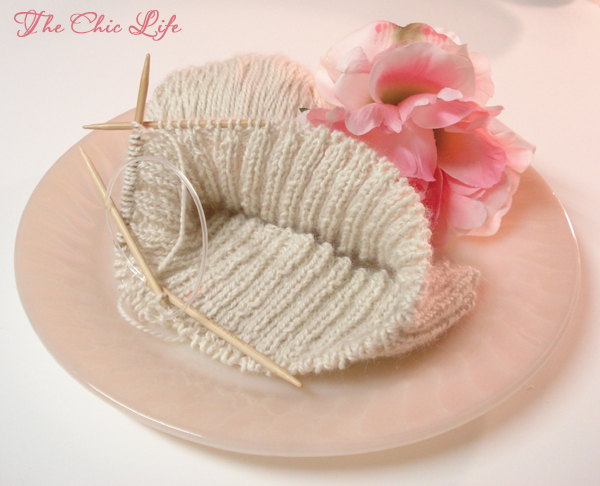 I'm making them with Debbie Bliss Baby Cashmerino. They are going to be special booties...you'll see. See Bailey in the background playing it cool...uninterested...totally not paying attention to what I'm doing? This is him about 5 minutes later. He starts at the opposite end of the couch and inches his way over. Eventually he ends up in my lap completely blocking me from my pattern and from being able to work on my project. He is such a goober! Hubby took the dog out this am and let me sleep in...thank goodness because sleep seems to be the only thing that makes me feel better, and I do feel a little better today. I'm getting there! Mr. 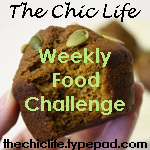 Chic took me out for a pancake breakfast (yum!) and then we did a quick stop at the grocery store so he could pick up some brews for the football game later today (Panthers vs. Cardinals). For some reason, the restaurant from this AM was having problems with their water and they were not serving any coffees or teas or tap water. The food is fab there, so we stayed, but I needed some coffee still. Hubby got some gas station coffee from the place next door, but the food came out so fast, I almost didn't need it. In fact, the food got to our table before hubby got back with the coffee. The coffee was decent but by the time we got back, I craved a wee bit more caffeine, so I went for some black tea. I originally wanted to pair some MateVana with some Rooibos Caramel, but I was out of the MateVana (note to self: get more MateVana next time you're at the mall), so I just went with a Thai Tea Blend. I got a lot of my teas (and all of my loose-leaf teas) from Teavana - do you have one of these places in your town? We got one a couple years ago and when I found out about the place, I went a little crazy and got about 6 tins of tea (plus accessories). I didn't get them all in one stop, but still! Today, I got use out of one of my teas and all my accessories. I used my Teavana Pefect Tea Spoon to drop a couple teaspoons of loose leaf tea into my Teavana® Perfect Tea Maker (16oz.) and then it was steep time. Once the steeping was complete, it was time to get the tea into my Teavana Perfect Tea Mug. Then, time to add sugar and milk. And, finally, time to enjoy! After relaxing for the tea for a bit, I was off to hit up the yarn shop where I met up with the Charlotte Purls. I'm not a member (yet), but sweet Stacey welcomed me to join their event. Thanks hun! I won a coupon for an additional 10% off my purchase today and used it to get some yarn for a couple projects I've been eying in the Debbie Bliss mag (the vintage pink Debbie Bliss baby cashmerino for the knee-high socks, and the Debbie Bliss luxury donegal tweed for the Lacy Scarf) and a ball of Mille Colore. A couple girls talked me out of the Blue Sky Organic Cotton and the Blue Sky Sport weight (that I eyed awhile back) balls of yarn, which was probably a good thing. Phew, with all this yarn and all these WIPs to finish, I'm going to be a busy girl! Mr. Funky Super Crochet Hat - Complete! Even though I woke up still feeling icky today, I went to work. I probably shouldn't have, but I always feel bad about staying home unless I have a doctor's note or something...even though my bosses have NEVER asked for one. Anywho, no cooking posts for tonight. I took photos of the easy "cheater" meal I make when I feel sick, don't have any food around, or don't feel like making anything - Egg Drop Soup, but I wasn't happy with the photos, so I think I'll save that for another day. Tonight, I bring you proof that I finished a WIP for once. Remember this Mr. Funky Super Crochet Hat WIP from forever ago? I actually finished it a long time ago...I just never photographed it for whatever reason. I'd show you the matching scarf WIP, but alas, that is but a long, sad chain stitch. In better progress-news, I have worked a few more rounds on my knit hat WIP tonight while I try to rest and recoop, now that it's all fixed thanks to Sandy. The yarn is thin and the needles are tee-niny, so it's a slow-moving project, but I'm hoping to have it done so I can wear it some time this winter. Cross your fingers. I worked a full day today (even though most people were off or leaving early at my office) and even had time to stop by the yarn shop (thank goodness for late night hours) to get emergency help from my favorite instructor, Sandy, on that broken piece of yarn on my WIP I mentioned the other day. Sandy simple pulled needle off my WIP, pulled the yarn off the scarf until we got the broken piece of yarn out, cut the break, picked the loops back up, and tied on a fresh piece of yarn. She made everything look so simple, I felt sheepish for even asking her to help me, but I'm still basically a knitting-newbie, and Sandy is, thankfully, always happy to help. So, I have more tails to weave in now, but I won't have to worry about all my hard work going down the tube due to one small break in the yarn. Woohoo...now, I can proceed with my WIP without worry! Oh, and sorry for the blurry photo, but black yarn is insanely difficult to photograph! Oh, and lookie what I got! I got a set of pots & pans from my mom - a belated wedding gift. Actually, she got them on time, but I was hoping to have a house by now to put my new pots & pans in and have been putting off taking them home and using them. Since it looks like we'll be in our little apartment for awhile and since my non-stick pans are getting scratched (and scratched non-stick is apparently unhealthy to use), I went ahead and got them. I can't wait to start playing with them! They're still sitting in their boxes in my ktichen right this very moment, but I am already planning to dig into them when we return from out-of-town. I've never used non-non-stick, so I hope I don't regret asking for stainless! Which do you prefer - non-stick or stainless pots & pans? When I came to a hard stop on my dad's scarf, due to the broken yarn, I lucked out by having another ball of yarn, needles, and a pattern I found for free at the yarn manufacturer's web site, which I brought with me to my parent's house...juuuuust in case. With the pressure of finishing a Christmas gift off, I was able to look forward to starting a new knit WIP. Actually, I'm pretty proud to say that I taught my sister (the crocheter) how to knit this past Saturday, and she worked her garter stitches into the beginning of a scarf, while I started on my own scarf. The yarn is Misti Alpaca Hand Paint Chunky - Baby Alpaca in the beautiful colorway, that I simply couldn't resist, called Havasu. At $21.95 per ball, the yarn was quite the splurge, but I did luck out by finding a scarf pattern on Misti Alpaca's web site for free that also looks super cute. 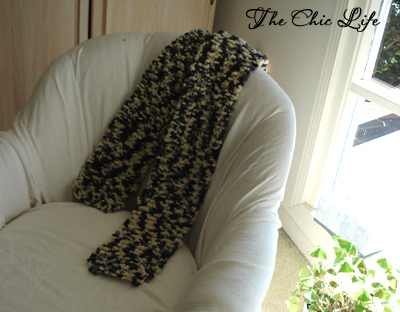 The pattern is called Misti Chunky Ribs & Ruffles Scarf, which can be found here. I also rationalized the purchase of the uber-luxe yarn be deciding to make it for someone special who I think deserves only the best of the best. Can't say who yet...I haven't given it to them. 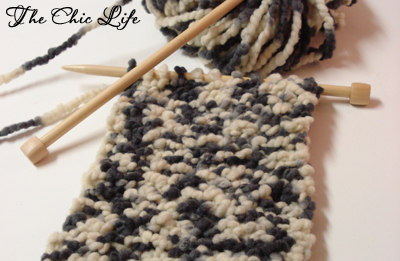 The baby alpaca yarn is so soft and amazing to work with and the pattern is shockingly simple. The pattern looks so much harder than it actually is - I highly recomend giving it a whirl, though you may want to see the finished product first, eh? Anywho, my fave thing about this yarn is the combination of colors. At first glance, the yarn looks quite neutral, but when you start working with it, you see briliant turquoises, deep purples, and even gentle pinks, in addition to the other lovely neutral colors. I probably won't be able to work on this project again until after the holidays (priorities, priorities), but I can't wait to see the finished product! Ok, I'm off to do some laundry and package a jewelry order. G'night! My sister and I met up with blog friend, April of theartchics (click), and her daughter, Bella, for a fun day of yarning around this past Saturday. First, we met up at The Needletree, where I fell in love with several more balls of yarn that I managed to somehow leave in their cubbies. Take this yummy, oh-so-soft Sublime yarn, pictured above. I was actually able to let go of it and put it back where I found it. Yarn people, you know how hard it is to put back an uber-soft ball of yarn, right? Either way, I do know where to find it now...heehee. Next, we headed out in search of food and hit up April's suggestion, Bellacino's, for some delicious pizza. It was good stuff! My sister and I actually split this tiny 8 inch pizza since we were having our Christmas dinner later that night. Plus, I had to save room for one last favorite snack of mine: the elusive Pistachio Latte. So, we headed to one of my favorite haunts, Coffee Underground, which is the only coffee shop that seems to carry this concoction I so craved. Only problem was...it turns out someone discontinued the pistachio flavor. *sad face* After giving a pitiful look to the lady at the register (who I didn't realize at the time, but now think is the owner...oopsie), I ordered a Turtle Mocha - my other fave drink of theirs. The Turtle Mocha is basically a Mocha with caramel syrup, and it's quite tasty. CU always does a great job with their froth, too - it's always nice and thick. Oh, and check out the art that was on the wall next to our "lounge" area (we were sitting on two couches). Isn't it pretty? So much nicer in person, really. The painting had all kinds of vibrant colors and even buttons, which added fun texture. April and her daughter had hot chocolates and my sis had a Strawberry smoothie. With drinks in hand and cozy couches ready for the lounging, sis and I got started on our WIPs, and April started on a new WIP for her hubby. Sis actually finished her WIP over coffee, but I was not so lucky. The black WIP on the table was mine and is going to be a scarf for my dad. Since we celebrated Christmas with my family this weekend, my scarf WIP was supposed to be complete by this afternoon, but I just didn't quite make it. Actually, I ran into a technical difficulty when I realized that one of the plys of my yarn was split. I'm planning on taking it to the yarn shop to see what they think - if I should keep going and hope the yarn doesn't break or cut out the broken yarn and tie a new piece of yarn on. I ended up wrapping the WIP - yarn, needles, and all - and let dad unwrap it today. He said it was the thought that counted, so at least he knows I tried. I'm hoping to have his scarf done before the weather starts warming up again. Wish me luck! Anywho, I had a great time hanging out my bloggie buddy, April, her daughter, Bella, and my sis! We'll have to do this again soon, girls! One good thing about holiday traveling, besides getting to hang out with friends and family, is getting to visit the shops, boutiques, restaurants, and other fun places you wouldn't normally be able to see on a regular work-week. I've been on a bit of a roll hitting up new yarn stores. Last time, I visited Yarns, Etc. in Chapel Hill, this time, I visited The Needletree in Greenville, SC. I talked my sister into going to the yarn shop with me and we were both greeted with a happy yellow cottage and a friendly face in the window - see the "puppy"? My favorite part of the shop was the cozy little fireplace. I think I'll bring a WIP with me next time I visit so I can warm up while I work. Of course, they had a great selection of yarns, too. I didn't do much browsing as I was on a mission to find a specific color/type of yarn, which the nice shop owner helped me with. My sister searched for a nice crochet hat pattern and some yarn to use for the project. Oh and do you see that bin in the bottom left of the above photo? Here's a closer look. Isn't it hilarious? I didn't browse in there, but overhead a man who reached in and found a luscious brown ball of yarn he was warming up to...till he found out it was $95 (it was made from bison or something). Oh, and here's the friendly "puppy" who greeted us from the door. I put "puppy" in quotes because the "puppy" was a whopping 65 lbs! 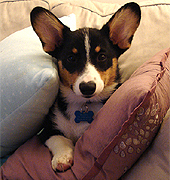 You'd never think (at least I didn't) that this "dog" was really only about eight months old! Anywho, I'm hoping to hit up Greenville again before the year ends and when I do, I'll be showing up to this yarn shop with WIP in hand (and probably a coffee), ready to snuggle up next to the fireplace. Doesn't that sound like a lovely way to spend a winter afternoon? I was thinking today that I should round up all my WIP's and take a photo of them just to show myself how many of them I actually have...and to prove that perhaps I should focus on finishing one of those WIP's rather than starting a new one. Instead, I decided to start on a new scarf idea I have in mind for a Christmas present for someone. The scarf is a going to be a simple garter-stitched scarf that I'm planning to add lots of tassels to. I found this Paton's Melody Quick & Cozy yarn at the yarn shop, Yarns Etc., I visited this past weekend and thought it would make a great scarf present. Besides being a pretty cobalt blue, the yarn is also very soft and should knit up quickly since it's a pretty bulky-weight that I'm knitting on size 15 needles. It's been almost a year since I've knit anything, so I stopped by the yarn shop tonight after work to get some quick knitting refreshers from the nice girl working tonight. Sadly, I needed help to remember how to cast on to make sure I was remembering the right way to knit and purl. The girl was very helpful and kind and luckily, I hadn't completely forgotten how to do these basic knitting techniques. It's like you always hear - knitting is just like riding a bicycle - you never quite forget, but sometimes you need a push in the right direction. At least this garter-stitch scarf should be good practice for me, eh? And since most of those other WIP's are non-Christmas presents, I'm going to worry about getting to those later...probably after the holidays. My jewelry business (D Celestine) and love of beads of all shapes and sizes has sent me on many-a-trip to the local bead store of whichever city I'm in. My new passion for yarns now has me in search of the local yarn shops of whichever city I'm in. I took advantage of being out of town this past weekend to scout out the yarn shop of my MIL's town and found out about Yarns, Etc. through a quick google search. Upon entering the store, I was immediately greeted with a friendly "Hello!" from the shop owner, Mary Stowe. Mary offered me a helping hand more than once while I browsed her beautiful collection of yarns in search of yummy strands for future Christmas presents. As usual, I fell in love with more yarns than I could get in one day. I'd love to have a ball or two of this Nashua Handknits Natural Focus in Indigo (color NFW.0085). I'd also like a couple balls of Nashua Handknits Sitar in Olive Tree (color NST.0771). Oh, and I'd never heard of the Cuzco by Berroco, but Berroco is the brand of yarn I'm using for my ripple afghan and it's really great stuff! I'm sure this Cuzco is just as nice. I'd like to make something nice, and knit, and lacy with this Zara Total Easy Care Merino Extra Fine in color 1653 - a black and white combo that would be so chic as a scarf. 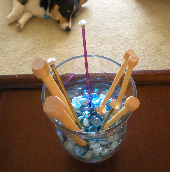 I've been doing really good with the whole "self-restrain" thing and managed to only get three balls of yarn. Two, which I won't show for now and the one pictured above - Misti Alpaca - Hand Paint Chunky in the color Havasu - a beautiful colorway of browns, blues, turquoises, greens with hints of yellow and pink. I'm supposed to be making this as a present for Christmas, but I really want to keep it for myself...haha. At least I know where to get more should I decide I "need" some. Oh, and can I just quickly share these sample afghans that grace the shop's couch? Mary knitted these with her own two hands, and I think they are fabulous! Aren't they gorge?! It was another beautiful fall day here in the Carolinas, so I decided to take full advantage of it. I slept in a little - till about 9:30am and decided rather than making a pot of coffee first thing, I'd go straight to the yarn shop. Of course, part of my reason for going straight to the yarn shop was b/c I could get my morning cuppa joe at the coffeshop next door and then head to the yarn shop. I ordered a pumpkin spice latte, which was so yummy and hot and what I thought to be a very fall-like drink. With coffee in hand I found a cozy spot near two very nice ladies and my fave yarn instructor, Sandy. I say "yarn instructor" b/c she is an expert with all things yarn-y - knitting and crochet, mostly. 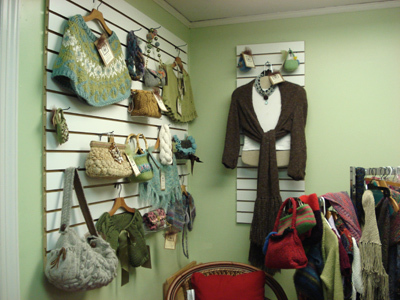 Here's a quick photo of one of the walls of yarn from my fave yarn shop, Charlotte Yarn. They recently moved to a new location and it's just so open and airy and warm and inviting. The shop has large windows that let in tons of natural light and there are chairs set-up through out the shop, welcoming yarn fans to kick back and work on their projects with other knit and crochet friends. I gabbed quite a bit and made some new friends...I must have been there a couple hours...phew...how time flies when you're having fun! At least I managed to get some good progress done on my ripple afghan. I also exerted extraordinary self-control by not buying a single ball of yarn the whole time I was there, even when this lovely basket of yarn was staring me down just next to my chair. I think the turquoise one on top was screaming at me a bit, but I put them all out of my head and kept rippling along. But, alas, I knew I couldn't stay at the yarn store the entire day, so I headed off to a local shopping center to run errands. I picked up icing gel colors (for a baking experiment I made tonight - photos to come later), a couple donuts from a local bakery (b/c I just can't resist them), groceries for tonight's dinner, and a quick lunch from this hot dog vendor who I found out is a retired IT guy. I ended up taking a couple hot dogs home to the hubby, too. The hot dogs were angus beef...have you ever heard of such a thing? Either way, they made a nice, quick, and cheap lunch for us today. It was $6 for three hot dogs, and we had some chips and mini-cokes back at the apartment. After letting our food digest for a bit, we took Mr. Bails out for a walk. I must have taken about fifty photos from just our walk today, so I'll be posting those in a separate email...I'll try to get that up tonight. I'm going to work on posting stuff closer to when they actually happen - not sure how that's going to work out, but I'm going to try. I don't know if you've ever made a ripple blanket...or if you even crochet for that matter, but word on the street is that I will be sick of ripples by the time I'm done with this afghan. I think I'm in the honeymoon phase right now (on row 11 - 2 rows per ripple, that is) - so far, so good. I'm enjoying playing with the colors - watching one boring gray row get matched up with some other fun colors - seeing how they all mesh together. 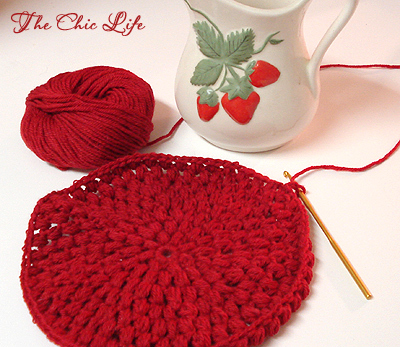 I'm making my ripple blanket with Berroco Comfort yarn - a super soft yarn that is really nice to work with. The pattern I'm using actually calls for a DK weight (Comfort is worsted), but I figure maybe my afghan will just be slightly larger than it's supposed to be. I'm not a fan of measuring...and really...does an afghan have to a precise size if you're just going to cuddle with the puppy (or the hubby) on the couch with it? I've been buying the yarns for my blanket during random trips to the yarn store - trying to remember each time what I already have in my stash and to visualize how the new colors I want to get will go with the ones I already have. I'm so glad I finally combined all my yarns into one bin so I can really see how everything is going together. I've actually carted the entire bin into the yarn shop the past two weekends so I could see where colors needed to be swapped out or added. If you're working on a blanket with lots of colors, I highly recommend bringing all your yarns into the store so you can see if that new pink color really does go with all the other colors you've worked into your creation. Anywho, you guys know I've been working on organizing and getting things together. I think I'm going to take a bigger step towards attaining some sort of harmony in my life...or perhaps, even several small steps towards bettering myself. One simple thing I'd like to do is work on "me" time. 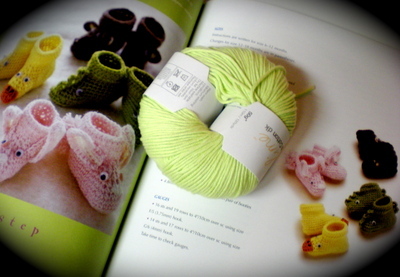 I've been trying to do a wee bit of crochet or reading every day...just to wind down from the day's craziness. I've been trying to work on this task for the past couple weeks, but some days just seem to slip away from me with to-do's and what not. In fact...it's getting late here, so I'm off to work a few ripply-stitches and hit the sack. Nighty-night! Earlier this year, I fell in love with the gorgeous ripple blanket I saw over at Posy Gets Cozy and decided that when my crochet skills were more up to par (or when I felt daring enough) that I would try to make one for myself. So Bails and I curled up on the couch with Alicia's suggested ripple pattern in the Vintage Crochet book and got started. Here's what I do to my crochet projects because I can't count. I mean, I can count...I'm just not good at it. lol. I like to say I have the memory of a goldfish. (You think this is messy...you should see me playing tennis! lol) Anywho, I think just don't pay attention when I'm counting, and I lose track of what number I'm on and it's just not pretty. So, I came up with a solution. Here's my trick to counting crochet stitches: I count in smaller numbers (10's and 20's) and mark those groups with stitch holders. I add up the stitch holders and multiply by the number of stitches in each group and I have all the stitches counted - easy as pie! It really is easier - especially when you've got a lot of chain stitches to start with. Not a bad start...just a couple more hundred rows to go...woohoo! Why is everyone around me having babies?! What in the world!? Good thing I have a good booty pattern b/c I'd never be able to keep up with all these baby gifts if I had to make something bigger. I swear, I have become a baby-booty-making-machine! lol. First, it was the Dinosaur Booties, now these. 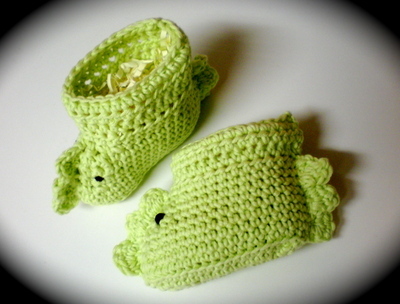 These floral booties were actually made with the same yarn used for the Dinosaur Booties, as well as the same basic booty pattern. Since these booties were for a girl, I decided to forego the animal attachments and add flowers instead. These flowers are from Nicky Epstein's lovely Crocheted Flowers book. I hope the family enjoys these! 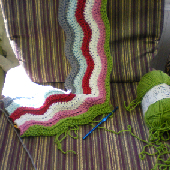 I'm also hoping for more free time as the year goes by so I can start on my first crocheted-blanket. I want something warm and cozy to cuddle up with when winter comes. I'm eyeing patterns in my books and I think I have one picked out, but you guys know I'll tell you when I figure that all out. Mon Beret, Il Est Fini! Salut, mes amis! I did it! I finished another project...and you guys thought I never would. Ha! I showed you! What's that? You did think I'd finish a project? Ok, well then...I guess you showed me...Ha!? Anywho, I finished making the Polly Beret (an original Alicia Paulson design). It was such a fun pattern and the finished product is super-cute. 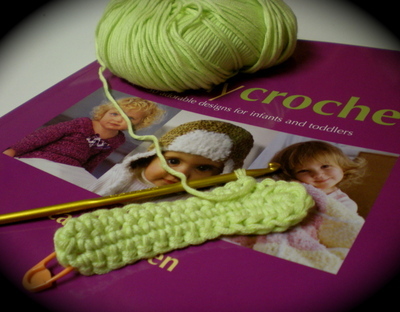 If you know how to crochet, you should get this pattern when it goes on sale...I'm a beginner, and I made my way through it, so any level crocheter should enjoy it. I even got to wear my beret to work yesterday...my little creation has seen daylight! I noticed the other day...it's the strangest thing, really...something about this beret is making me kiss-y. Maybe because a beret is French and French people like to kiss? Berets are French, right? And French people like to kiss, right? 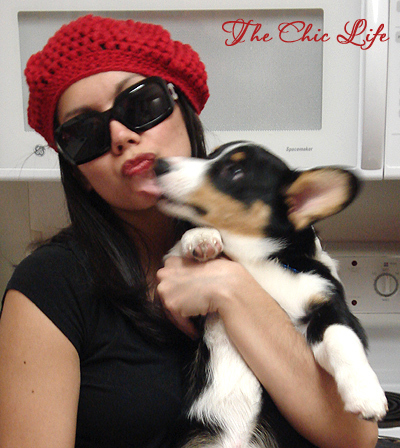 I don't know for certain, but I do know this beret is making Bailey pretty kiss-y, too! Although, now that I think about it, the kids on the playground used to call me "The Kiss-y Girl." Yea...I chased the boys around the playground and tried to kiss them. We're talking 3rd...maybe 4th grade. Pretty embarrassing stuff, huh? Good thing we moved to a different state in 4th grade, and no one remembers me as that any more. How hard would that be to live down? Ok, so I'm bluffing...and ok, ok, the project is not top secret, but sometimes you can't just post stuff w/o asking permision, ya know? Now that I've made such a big deal, you may be disappointed to learn that I've been working on only one small project. I'm currently testing a crochet pattern for Alicia (Posie Gets Cozy), which is really not so "small" for me and is something I actually think is pretty darn cool - top secret or not. 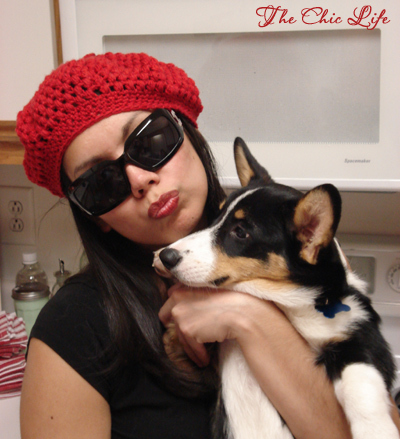 I've been working on her pattern, Polly, which is for the cutest crocheted beret you will ever see. I started on MLK day and have worked a couple rounds every night since. I finished the hat portion last night, but need to tuck in all the tails and make the top loop. I'm also supposed to "block it lightly" but I'm not exactly sure what that means, so I need to research (read google it). The pattern is so cute and has these nifty little "puff stitches." I'd tell you more about them, but seeing as how they're "top secret," I think I'll just mention them...for your safety, of course. What's that? You don't buy that whole top secret thing? Ok, that's fine...especially since I already told you I was bluffing, but seriously, believe me when I say that if you are into crochet, you will love this pattern. It's still in test mode, so it's not available for purchase yet (that I know of), but I'll give you guys a head's up with Alicia adds this gorgeous pattern to her web site. 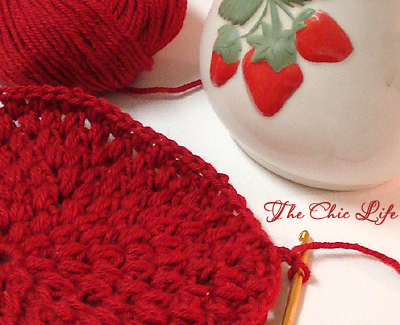 Oh, and the yarn is just so pretty - look at that yummy red color! I just got the yarn the pattern recommended - CashSoft DK. This is my first time working with CashSoft and it's so nice. I'm such a yarn snob...I'm a total sucker for all those luxe and uber-soft yarns in the yarn shops. I can't wait to get my first ball of cashmerino...mmm. If yarn is your thing, what's your favorite yarn? I got this gorgeous, super chunky, 100% pure new wool in a cream/gray/black colorway from a grab bag in a local yarn shop. I purchased two balls of this yarn, originally marked right around $16 per ball, for a mere $10. Oh yea! The yarn was almost a boucle-style yarn, and it knit up pretty well. I just did a simple seed stitch since the yarn was so chunky, and you could hardly see the stitches. I was running a bit late on the project and actually had to finish it up while my mom was around, but she didn't care (at least she said she didn't). Maybe she enjoyed seeing the process? Who knows? I think it looks pretty good, and it's definitely going to help keep her warm! This "new wool" is serious stuff! 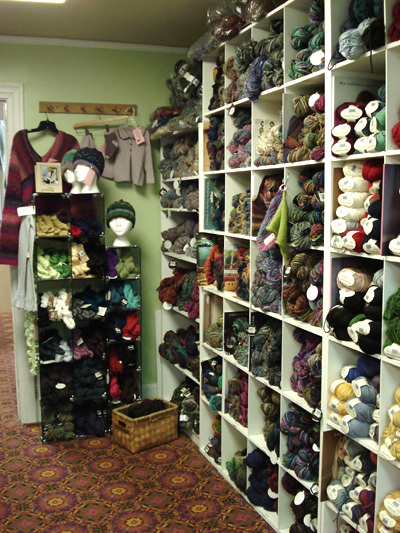 What is it about the yarn shop that makes you feel all warm & cozy inside? Hmm...maybe the fact that you can use the yarns to make something (a sweater, an afghan) to keep you warm and cozy? I don't know. But, what I do know is that I love my little trips to yarn boutiques. You probably know exactly the type of yarn shop I'm talking about and if you're lucky, you have a great one in your hometown. If you don't know what I'm talking about then you just don't know what you're missing! Quick, schedule a trip to visit one now! For me, a trip to the yarn store is a way to escape the craziness of my home. My self-imposed craziness, that is. I've spent the last week or so working on clearing the clutter I've created through my insatiable lust for craft supplies and my ability to fall head over heels in love with every craft I meet (thus, warranting additional trips to buy new craft supplies). Yes, by going to the yarn store, I take a breath and ooh and aah over the yummy cashmerinos and alpacas the yarn shop has to offer, gently touching each ball of color that catches my eye. This is the main room where they keep a lot of their alpaca yarns, chunky malabrigo (sp?) and lots of their new goodies, fresh off the delivery truck. Doesn't seeing all these yarns make you want to get your needles and hooks out? This is the "baby room." Not really, but that's what I call it b/c they keep all the yarns for their baby items in here, along with some other fun wool and cotton yarns. And, then we have the back room, where you can see many of the samples they have out. Patterns are available for each item hanging, so they're great inspirations you can actually make, should you be interested. There are samples hanging in every room, along every wall, but this room is my fave because there are several comfy seats back here so you can catch up with the girls and knit and crochet to your heart's content. 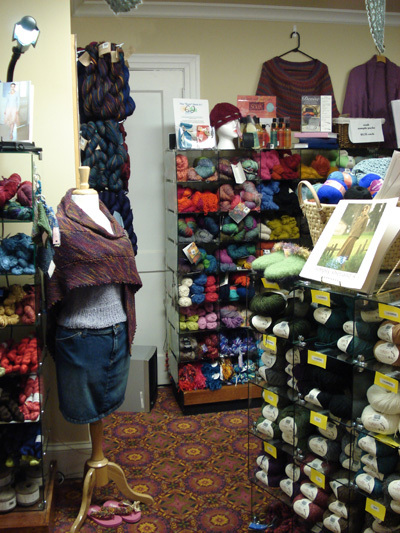 The back room is also where they keep all the delicious Debbie Bliss cashmerino and CashSoft yarns...mmmm. I still don't have any cashmerino, but I'm seeing some in my future soon! 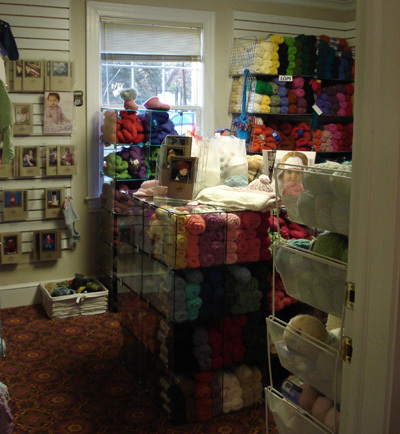 Do you have a yarn shop like this near you? 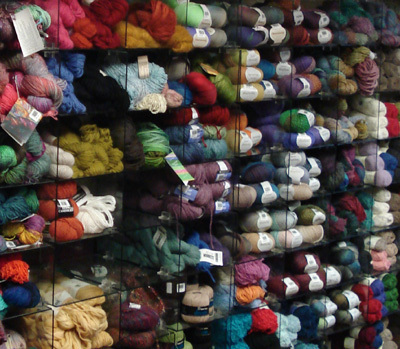 Where's your favorite yarn shop?